My friend Jolain told me that when she started her clothing line years ago, her goal was simply to make beautiful clothes. She said that wasn’t enough. “A business has to solve a problem,” Jolain said. When Kelly and I launched our new biz, we figured offering first-class writing workshops at non-luxury prices would answer a writer’s problem. nurture creativity and beauty in a society that overlooks the arts. Our biz does all that. We use Field Notes to keep score when we play cards. 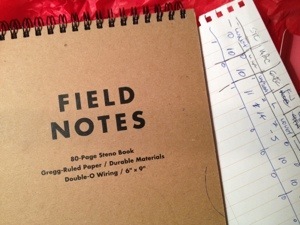 This morning I listened to a podcast about traveling salesmen (at Field Notes Brand, a company my brother co-founded). Ron Solberg praises the tenacity and brilliance of the early traveling salespeople who often sold books. And the customers appreciated how the salesmen delivered news, as well as products. They liked the free samples. “The trick really was volume, the number of stops you make,” Solberg said. In a sense, when I started the biz, I wanted to make and nurture beautiful writing the same way Jolain wanted to make beautiful clothing. But I am learning to sell as well as to create. As a small business owner, I need to sustain my biz, so I must do both sales and art. And for both, I need to value beauty, tenacity, hard work, and being in the moment. Yes, be active and make something good happen!